The climax of the super-successful series which has brought together the most influential writers and novels of the last 50 years, The Mammoth Book of Modern SF has work by some of today’s best-known writers. These were chosen by Asimov before he died as the most representative, and the most entertaining of the modern era. 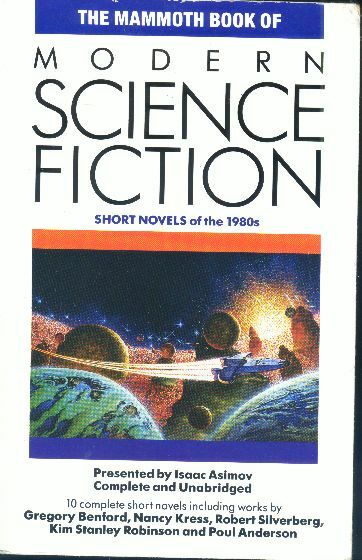 This is the sixth and final anthology of novellas in the series starting with The Mammoth Book of Classic Science Fiction. One isn’t entirely sure whether to count this as an Asimov volume or not, since it was first published in 1993, a year after his death, and he’s listed on the title page as the “presenter” and not one of the editors. (On the other hand, the spine does list him as one of the editors.) I count it personally mostly to round out the series. Like the two volumes that precede it, The Mammoth Book of New World Science Fiction and The Mammoth Book of Fantastic Science Fiction, it’s got some excellent stories but some glaring omissions. Included are Poul Anderson’s “The Saturn Game,” Kim Stanley Robinson’s “The Blind Geometer,” James Tiptree, Jr.’s “Slow Music” and Walter Jon Williams’ “Surfacing.” Inexcusably missing, however, are John Varley’s “Press Enter,” Connie Willis’s “The Last of the Winnebagos,” or Roger Zelazny’s “Twenty-four Views of Mount Fuji, by Hokusai.” Again, a mixed bag and not as good as it might have or should have been.